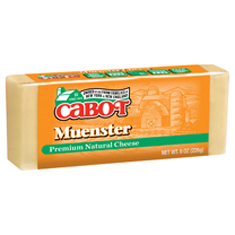 Mild and mellow, yet wonderfully flavorful, Cabot’s Muenster makes a monster hit with those who prefer their cheese on the calm side. 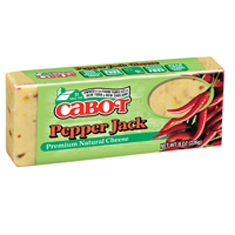 Monterey Jack tames the decidedly spicy, jalapeño kick of this colorful, south-of-the-border favorite. 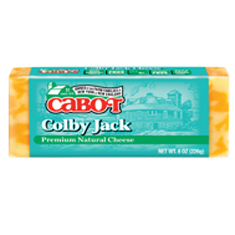 Similar in flavor to mild cheddar, tasty Colby Jack is softer and more elastic in texture, yet every bit as delicious, as its first cousin. 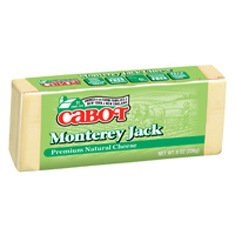 A combination of Monterey Jack and Colby, this smooth, mellow cheese is ideal for cooking, nibbling or serving with fruit and crackers. With its smooth, nut-like flavor and distinctive taste, this popular, mild-mannered cheese is an ideal alternative to sharp cheddars.